There are very few shoes in the $120+ range that I think are worth the money. The Nike Free Flyknit 4.0 is one, and the other that jumps immediately to mind is the adidas Adios Boost. The first two iterations of the adios Boost were personal favorites (see my reviews of v1 and v2) – they were do-everything shoes that excelled from speedwork on the track, to long runs on the roads. That’s probably to be expected for a shoe that graces the feet of many of the top elite marathoners in the world, but it’s a shoe that works just as well over a variety of conditions for a far-from-elite runner like me. adidas was kind enough to send me a pair of the adios Boost 3 for review purposes, and I’ve been running in them regularly for the past few months. Like its predecessors, v3 is 10mm drop (23mm heel, 13mm forefoot), and it weighs in right around 8oz in men’s size 9 (per Running Warehouse). Similarities with v2 don’t end there, however. Although adidas made some minor updates to the upper and sole in v3, the changes are very minor, and the shoe essentially feels exactly the same to me. As such, I’m going to keep this review relatively short. 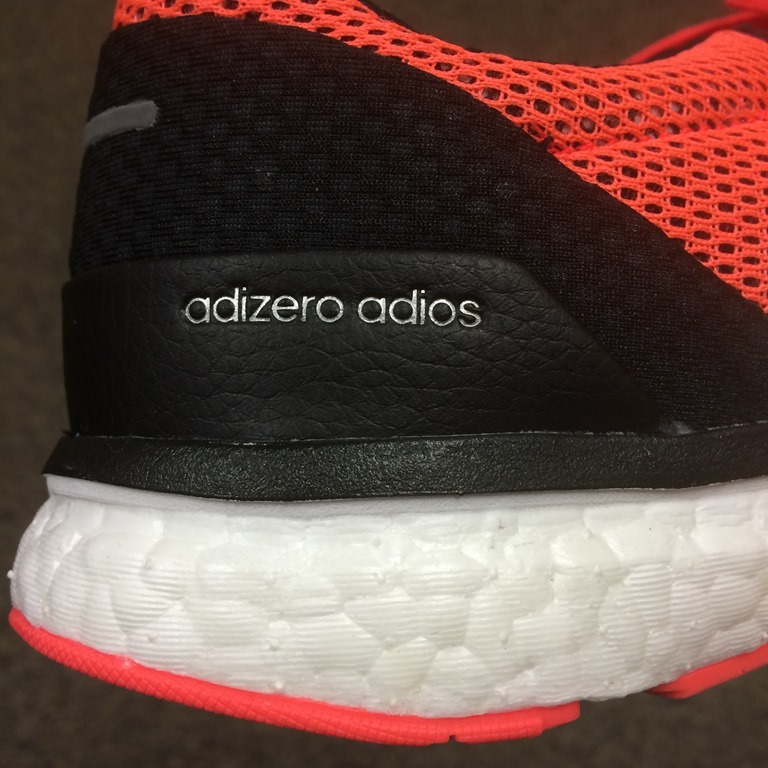 The thing I love most about the adios Boost is the sole. The heel is softish and cushy, but as the Boost midsole thins out under the forefoot to only 13mm, the feel is distinctly firmer and more responsive. Longitudinal stiffness from the midfoot forward is increased by the plastic Torsion System, and this helps give the adios Boost a snappy ride at faster speeds. Torsion system extends from the midfoot to a bit under the forefoot. Much like the New Balance 1400 and Asics Hyperspeed, I could use the adios Boost for races spanning distances from 5k to the marathon. It’s a very versatile shoe, and that’s one of the reasons I would justify spending $140 on it (that and the fact that the Boost midsole and Continental rubber outsole are quite durable – I think I could get more miles out of the adios Boost than the NB 1400 or Hyperspeed). 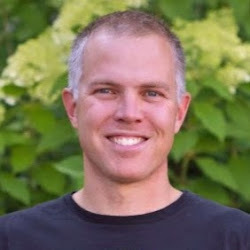 The upper of v3, though different, is very similar to that of v2. It has a throwback look that I really like, with a classic mesh and suede overlays. Like v2, the interior of the upper is pretty scratchy and not one that I would risk using without socks – this is one thing I’d like to see changed in a future iteration (NB fixed a similar problem in v3 of the 1400). The fit is not wide, but not so narrow as to be uncomfortable – going up a half size makes for a bit more room (I recommend sizing up in v3 as I did in v2). Perhaps the biggest change in v3 is the outsole, though from a function standpoint I can’t really feel any difference. 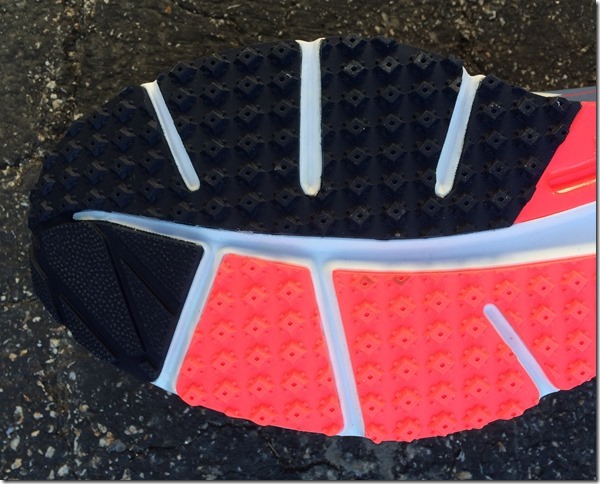 The durable Continental rubber compound is still in use in v3, though adidas added a bit more rubber under the forefoot, and got rid of the two strips of rubber nubs that extended from the midfoot forward in previous versions (see comparison photos below). 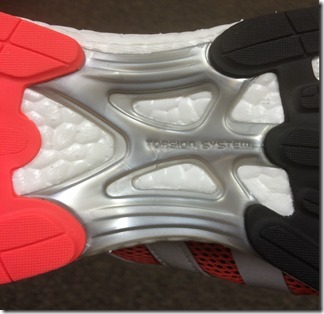 Soles of the adios Boost 3 (top) and adios Boost 2 (bottom). Different structure, but functionally pretty similar. If you’re a fan of the adios Boost and liked v2, then you’ll most certainly like v3. Changes are minimal – in my opinion this remains one of the best all-around shoes on the market. 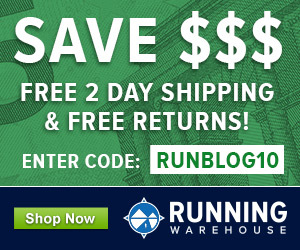 If you haven’t tried the adios Boost and are in a mood to spend a bit of cash, it’s definitely worth a look, and the combo of versatility and durability justifies the price (though I’d still like to see it drop about $20-$30 before I can rec it over shoes like the NB 1400 or Asics Hyperspeed). Kudos to adidas for not messing too much with a great shoe! The adidas Adios Boost 3 is available for purchase at Running Warehouse. You can also customize a pair of adios Boost 3 at adidas.com (resisting the urge!!!). I would love to try this shoe but adidas doesn’t seem to make it in a 14. Any idea why? Have been a massive fan of this shoe through version 1 and 2 and will likely upgrade when needed. 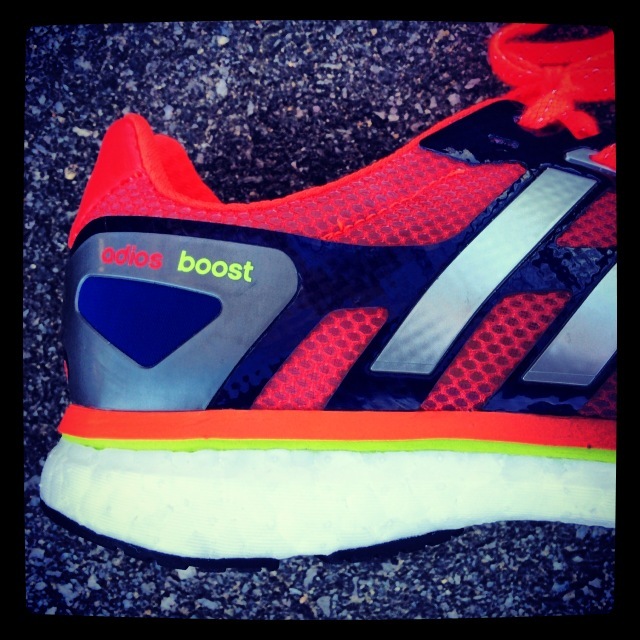 Pete there is a bit of debate going on in an Aussie running forum about what alternatives there are (with similar 10mm) to the Adios Boost that are still light and reasonably quick but offer a bit more cushioning for training particularly on longer runs. Any opinion on this? NB 1400 would be one option, maybe the new Brooks Hyperion. Saucony Breakthru another possibility. Came up with some truly hideous color combos. Tempted to buy for trolling next race. It feels like there is a little more room in the toe box in this version, and a touch more cush. I will definitely be wearing these for the marathon. This is exciting to hear. I’ve used the Adios Boost 2 as a racing flat and for speed work for the past two years, and it has proved to be an outstanding model. The ride is firm and the foot turnover is quick. Though the price is higher than other flats, I’m inclined to believe that you can squeeze more mileage out of the Adios. Excellent shoe! Excellent review! I LOVED the Boost 2, and snagged a pair of the 3’s as soon as I could. I can tell the 3 is a bit less shoe than its predecessor, perhaps a tad more narrow? Also, I wore a 10 in the Boost 2, and now am in a comfortably snug 9.5. the ride is the same I’ve come to expect from the Boost, but I like the way this one fits – more snug, and lighter. I’m so happy to see this review!! I loved the fit of the original adios and rocket, but with the boost v2, a strange cutoff at the big toe ruined them for me. When I heard the toebox for v3 had been widened my hopes went up! But when trying them on, the toebox is not the only thing that has been widened. The rest of the shoes is also noticeably wider and the midfoot has become slightly roomier which makes me glide around in all directions in this v3. Altogether v3 feels like a wider and cheaper version of the original. Not to mention the utter uglyness of the orange version. The blue one is nice though 🙂 So with this version, since Adidas chose to abandon my foot shape for something more mainstream, I’m finally abandoning the adios line and Adidas in general. Fortunately, Salomon and New Balance still care about people with my foot shape and have a few racing options for me. Adios Adidas, Adios! What a nice looking shoe! I’d get it just for its vintage look, alas not for €150,-. I tried a pair today in my running store of choice, and found it, as with most Adidas, very narrow. Not as tight as the Takumi Sen 3 but too tight to feel comfortable for long distances I’m afraid. I also have a pair of Hitogamis 2 which are quite similar on paper (12mm,21mm stack, same drop) but its spacious toebox fits me much better. How would you compare the Boost’s ride to the Hitogami? Just from walking, and jogging around the store’s short indoor track, I was under the impression that the Boost has a softer heel but stiffer forefoot. Except the fact that the signature Wave ride is quite different to the Boost characteristics, would you recommend the new Boost as a significant improvement as a long run trainer to my Hitogami 2, justifying its very steep price? I have run pretty much exclusively in the adios 2 and I couldn’t have a more different opinion of the update (I like v3, but feel a significant difference between the two versions). I suspect your mileage may vary depending on your footstrike pattern and running speeds, but the feel of the outsole at ground contact is very notably different in v2 and v3 for me. Generally, the v2 feels a little stiffer, and for my foot strike pattern I land very planted in the v2, where in the v3 I feel the curve of the sole and some rocker action. Also, the toe box in v3 is definitely wider, and the upper is much less stiff (not as locked in at faster speeds for me). 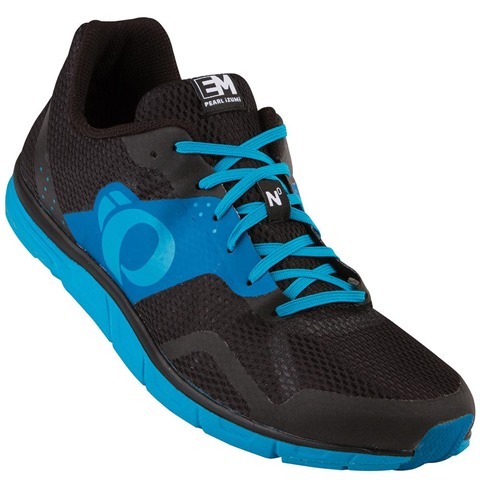 I still like the v3 but it will definitely not be a race shoe for me. Also, the orangeish colorway is not too bad in person. As someone else noted it has a bit of a retro feel. I loved the adios boost 2. Don’t love the AB3. Too wide in the midfoot, hotspots all over the sole (probably due to the over-generous helping of rubber which heats things up). Foot slides around everywhere. Can’t wait until these shoes hit mileage and I can scrap them. After one pair of v1s three goes in the v2 at 750 miles per pair and my first v3 with 575 miles I can say they are awesome. I just picked up pair #2 of the v3s. Use them for everything. I’m so glad they haven’t messed these up, each version has subtle and nice improvements. I’m lucky that I live in PDX and the adidas employee store is here and you can get 1/2 off passes regularly. Makes them even more valuable.